My birthday was this past Wednesday, April 28th , right in the middle of the week – perfect for a week-long celebration! In our Burlington, Vermont office, the April Cornell team enjoyed a wonderful birthday lunch in our kitchen / dining room overlooking beautiful Lake Champlain in springtime. Our big natural wood dining table was set with the calm blue of our Shannon Patchwork tablecloth surrounded by an eclectic set of mix ‘n match chairs. Sitting or standing, fresh fruits, salads, a selection of Vermont cheeses and baguette breads were shared as glasses clinked in celebration. Following all this was a beautiful traditional confetti white cake with ambrosia orange frosting!! I call this “The Birthday Cake of Dreams”!!! 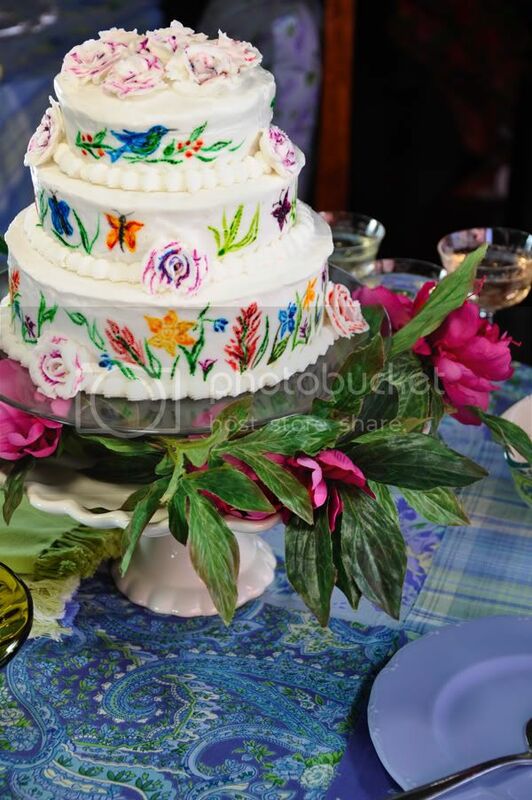 Three tiers of perfectly layered cake is covered with smooth frosting and decorated with paintings of my flowers and birds, rendered in food coloring “paint”! This moist and decadent cake was made all the more delicious served surrounded by smiles and songs of ‘Happy Birthday’. Spread sweet sentiments at your next birthday event and whip up this fabulous cake! 2. In a medium bowl, cream together the sugar and butter. Beat in the eggs, one at a time, then stir in the vanilla. Combine flour and baking powder, add to the creamed mixture and mix well. Add the rainbow jimmies and fold slightly to spread them through the mix. Finally stir in the milk until batter is smooth. Pour or spoon batter into the prepared pan. 1. Combine powdered sugar, Crisco, orange extract, 1/2 cup milk. Mix with mixer on medium speed. Add milk in small doses until desired consistency is achieved. NOTE for frosting cake the consistency should be light and fluffy. For piping and decoration the consistency should be stiff enough to hold shape. To get a smooth surface after frosted, dip knife in hot water to warm blade and smooth over surface. To paint – use bright vivid food colors and a fine paint brush. To give a water color effect, swirl brush in water before dipping in food color to soften the effect. For more info on Foodie Friday, Click Here! April, Your tablecloth is beautiful, and so is the cake! Happy Birthday to you! What a beautiful cake! It looks great with your tablecloth too. Hope this is the best year you have ever had! Happy Birthday April! You share a birthday with my son and I would have loved to be able to make him a cake as lovely! What a beautiful birthday cake - the flowers are breathe-taking! What a beautiful cake! Stopping by from FF. 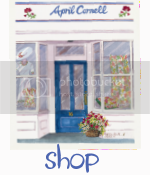 I used to visit the April Cornell shop in Eugene, Oregon years ago... this brings back fun memories:) Thanks for sharing. Happy birthday to you! 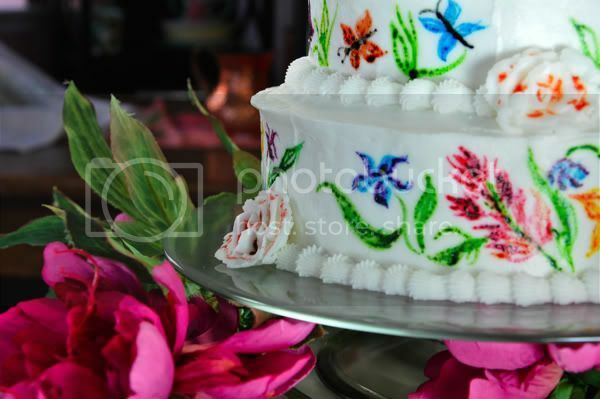 The painted icing is gorgeous! And I love the blue patchwork tablecloth! Happy birthday!! What a wonderful celebration, with a gorgeous cake! Somehow I don't think the recipe will help me, lol, I'll just enjoy looking at it! The birds are just wonderful too. Beautiful and unique cake!! A masterpiece! And happy birthday! Happy Birthday April! 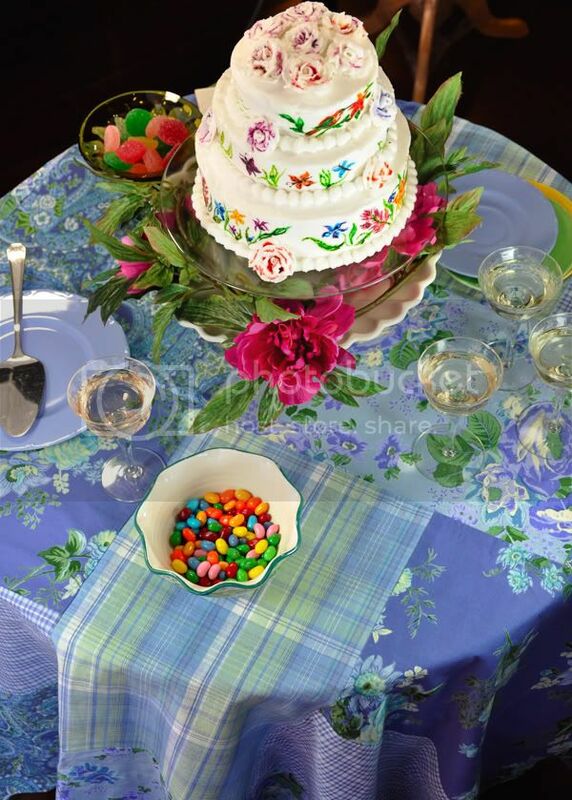 That cake is a work of art and it goes perfectly on the tablecloth.